The Jura Distillery Visitor Centre, on the same site as the former distillery shop, offers visitors a glimpse into the history and legends of Jura along with an opportunity to savour an authentic taste of single malt from the distillery. The centre also serves as the base of operations for the distillery's tours. The Visitor Centre takes its inspiration from the island’s legends and symbols, reflecting its literary, cultural and mythical heritage in West of Scotland folklore. Designed to replicate a traditional Hebridean bothy, there is a tasting unit which will serve rare Jura expressions alongside its core range, and a tasting table with a copper Diurachs’ symbol set into the centre. Photos of Diurachs past and present adorn the gallery wall, including key figures from the distillery’s 200 year history, bringing to life many of the associated myths and legends. Inside the Jura Distillery Visitor Centre guests can purchase an array of Jura merchandise, including hats, jackets, glassware and chocolates, alongside Jura’s extensive range of core and rare whiskies. Isle of Jura is hoping that the new Visitor Centre will create a long-lasting impression for the island’s rising visitor numbers. Since 2007, visitor numbers have steadily increased year on year, a considerable achievement given the island’s ‘unget-at-able’ location. 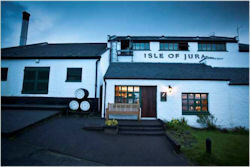 The increased interest is a reflection of Jura’s strength in the single malt market and the growing trend for whisky tourism. Jura single malt is now the third largest malt in the UK, with year on year growth of 60% across its key markets.